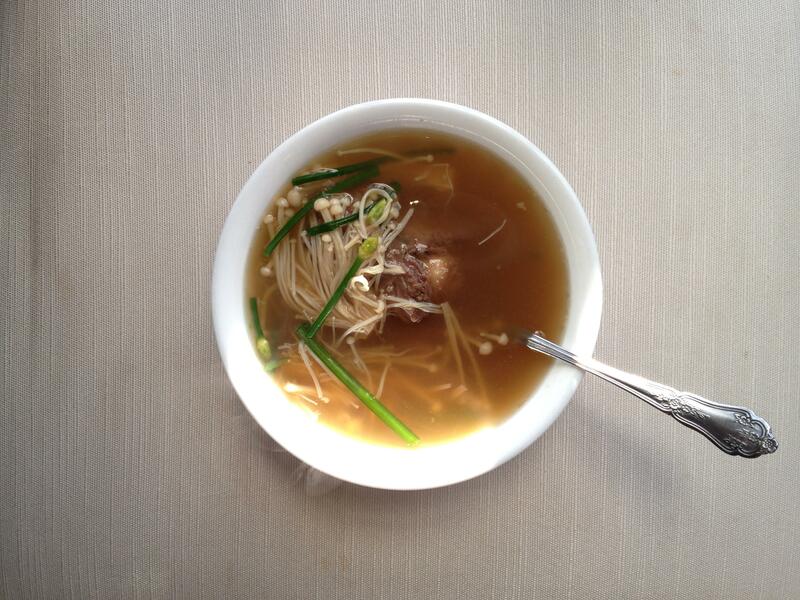 Sagol (사골, beef bones) broth is one of the most versatile soups. You can use this broth in countless number of Korean dishes such as kimchi-jjigae, duenjang-jjigae, ttuckmandu-guk, and janchiguksoo to name a few. Moreover, if you cook sagol-guk with satae (사태, beef shank) and somyun (소면, thin Korean noodles), you get sullung-tang (설렁탕). You can buy a bag of beef bones at Korean groceries for only few bucks. I have also found them at the freezer section of Whole Foods. You can probably ask your local butcher as well. Last time I went to the Korean butcher* in Flushing, NY, they gave me a free bag of sagol, which I cooked a few days ago. 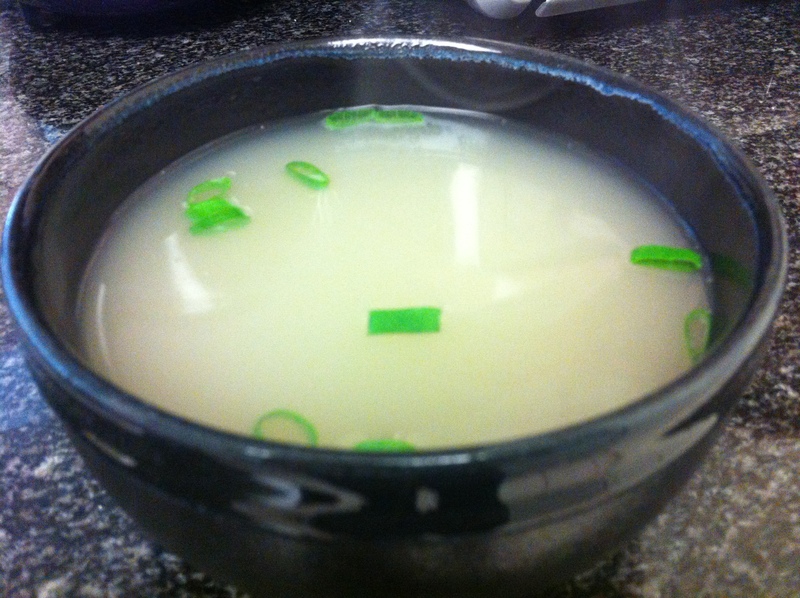 Sagol-guk is definitely not a quick and easy soup to make. Although it does take a long time to make, all you have to do is brew the bones for a long time, a “slow food.” Honestly, the first time I made sagol-guk several years ago, I vowed never to do it again. Boiling the bones on the stovetop for 2-3 days during the summer was simply frustrating and made our New York City apartment small like a sullung-tang restaurant for few days. 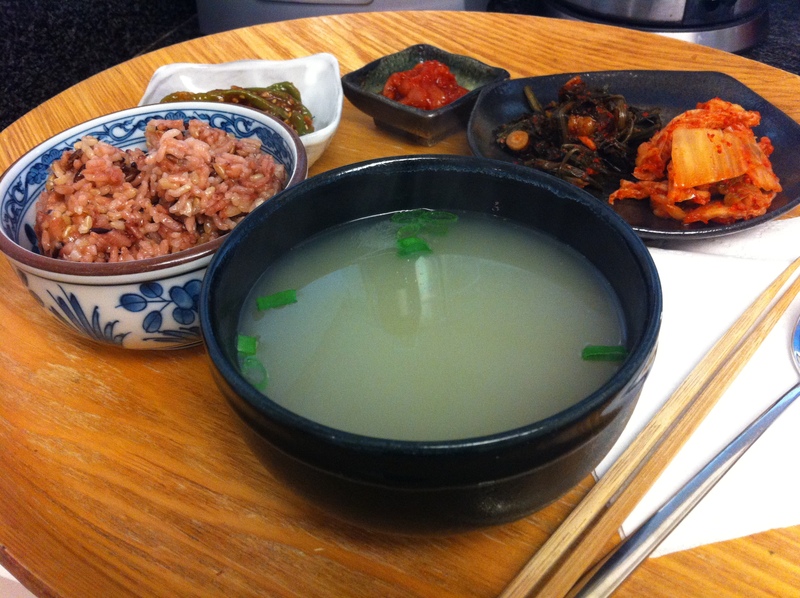 However, I want to show you how I was able to make a painless sagol-guk a few days ago with a slow cooker. You can go about your regular routine without ever having to worry about fire or gas with a slow cooker and even better, my apartment did not smell. 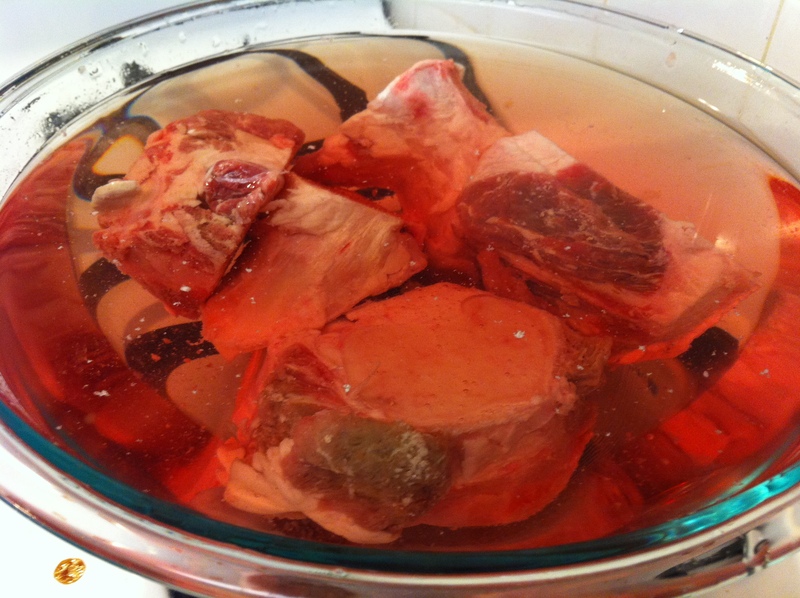 Soak the sagol (사골, beef bones) in cold water for at least 3 hours to draw out the blood. Rinse the bones and place them in a large heavy pot filled with water. Bring it to a rapid boil and cook for about 5-10 minutes. Throw out this water. This draws out the remaining blood, cuts the fat and removes any unpleasant odors. Rinse the bones once more and boil them in water again. Carefully move the bones and boiling soup into a slow cooker. 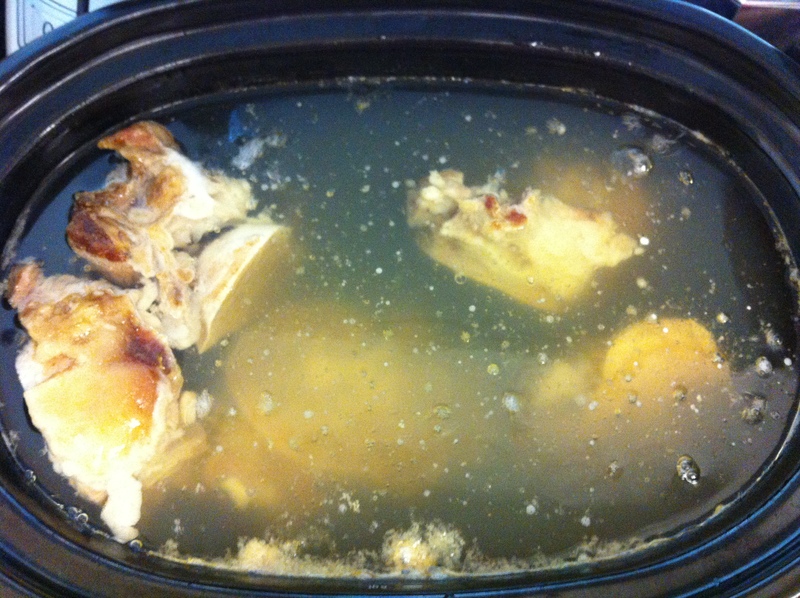 I placed the bones in the slow cooker first then poured the broth to prevent any splashes from the boiling water. Cook it on the “high” setting for 12 hours. I cooked it overnight. 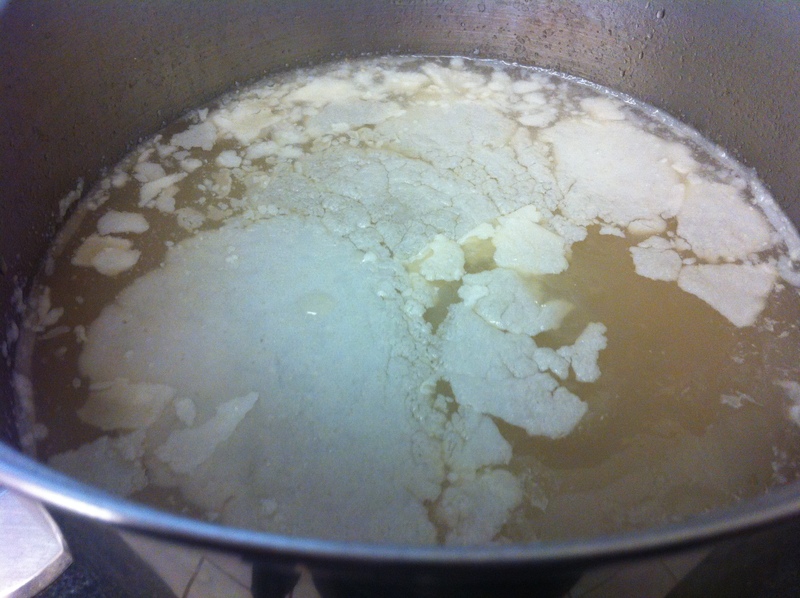 Move the first batch of broth back to a large pot and cool. Leave the bones in the slow cooker. 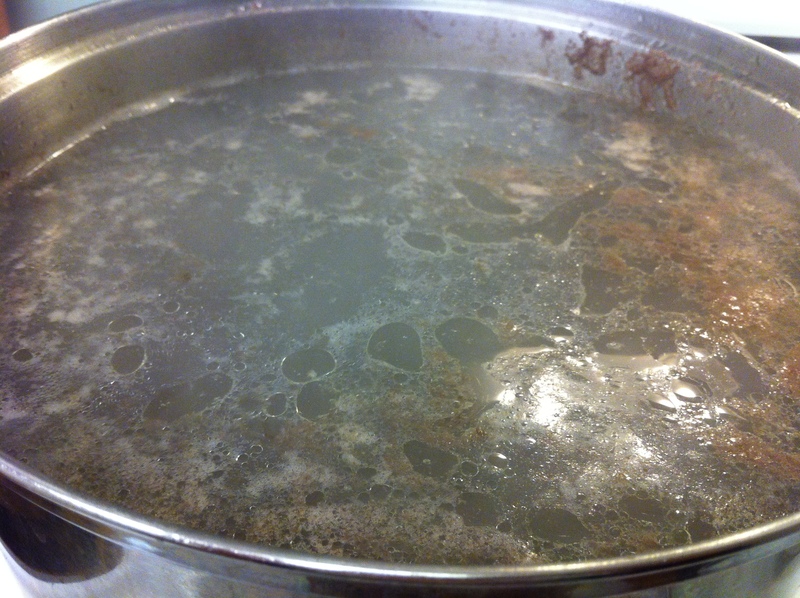 Once the broth becomes room temperature, place the pot into a refrigerator or outside if it is cold out. Boil another pot full of water and pour it into the slow cooker. Using hot water is key to making good sagol-guk in a slow cooker. This time, cook the bones for 24 hour on “high” setting. 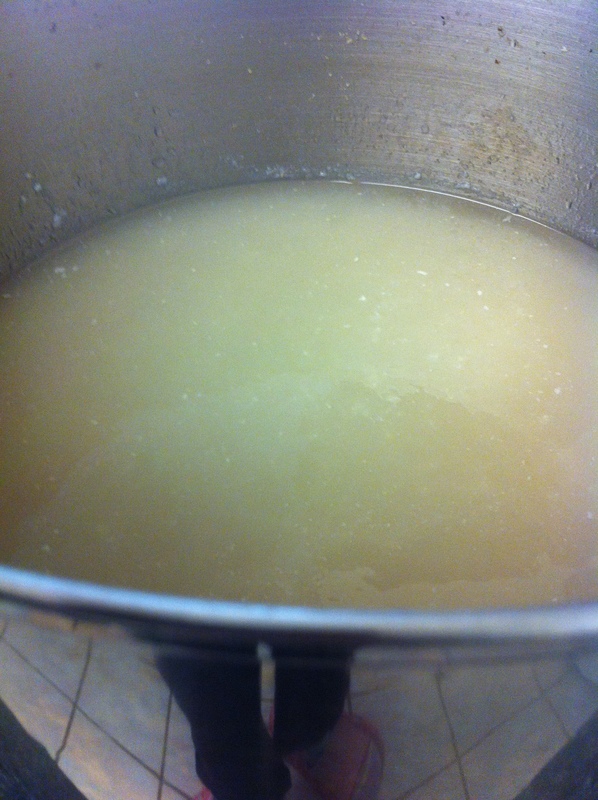 Fat from the first batch of the broth solidifies on the top when cooled. Remove the fat. Combine the first and second batch together when the second batch is done. Boil the broth on high heat with the lid off for about an hour or two. This condenses the broth to about 2/3 – 1/2 in volume. Cool the broth once more in the refrigerator. Skim off the fat. 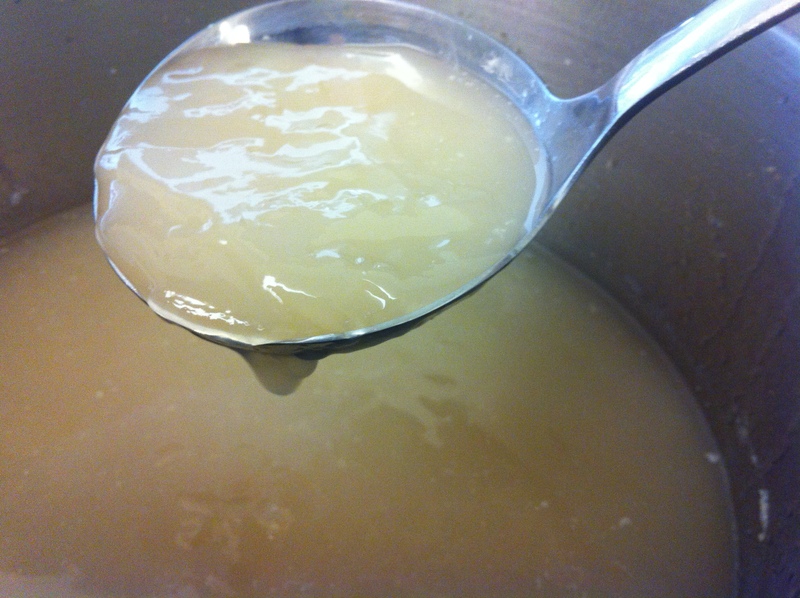 You will be left with a thick milky broth that has a jello-like texture. This color and texture is a result of the bone marrow in the bones and is a sign of a great sagol-guk. You can heat is and serve it as soup or use it as a broth in other dishes. 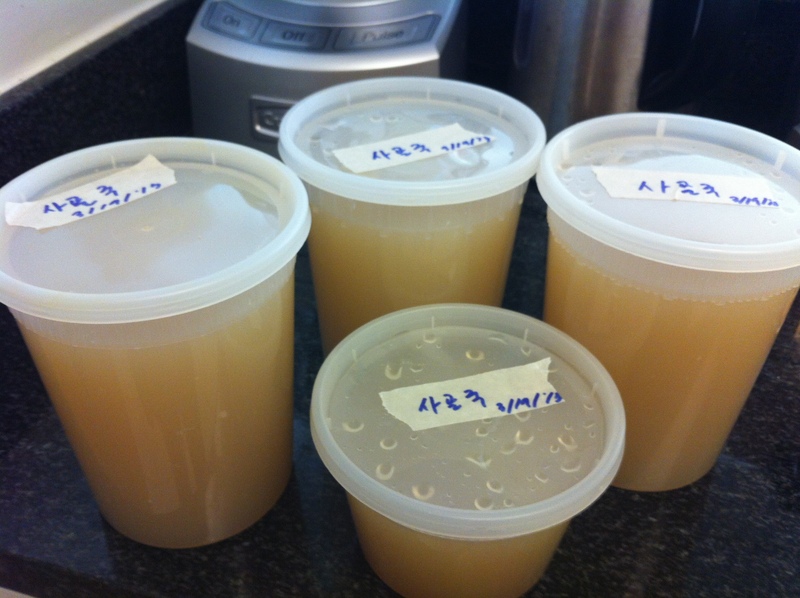 I make a large batch and store sagol-guk in the freezer for future use. This entry was posted in Broth, Good for breakfast, Good for dinner, Good for lunch, Meat/Chicken, Soup/Stew (국/탕/찌게) and tagged Beef Bones, Bone Marrow, Broth, Sagol-guk by gangnamkitchen. Bookmark the permalink. I am wondering what is the purpose to boil the bones again for the second batch? Am I ok to just boil the bones once? Does it make a difference in taste? Thank you so much for your question :). Throwing out the first batch of water does make a difference. Basically, there are three reasons for doing this. 1. This ensures the soup to have a clear broth. By boiling the beef bones/bone marrow once and throwing out the first batch, you draw out any remaining blood from the meat and bones that can cause the soup to turn out murky. 2. This also melts excess fat from the bones and meat. 3. Lastly, it eliminates any unpleasant odor that can come from the bones. Thank you SO much. I too have been looking for ways to cook for my sick mother. Thank you! Please let me know if you have any question such as any special dietary needs or concerns. I will try to help as much as possible. This is very helpful! I have a slowcooker but it is small so I’ll only be able to use a couple or few of the bones at once. Would you recommend any volume of water per bone? Also can I freeze the leftover bones that I won’t use right away? Sorry for the delay. I would recommend a 1:1 ratio for water to bone. You can make it thicker or thinner but I usually make it thicker so it has less volume, which makes it easier to store in the refrigerator or freezer. As for storing the bones, yes, I would definitely freeze the bones. In fact, I usually buy them frozen. I hope this helps… Please let me know if you have any further questions. This is the first time I’ve read a recipe for 사골국 that was written specifically for a slow cooker and I am SO GRATEFUL to you. There are many recipes that say “you can use a slow cooker for this” but it does not contain instructions that are specific to the slow cooker, like making sure it is boiling before putting it in the slow cooker and whether to set on low or high, etc, and this is so helpful. I’ve struggled with making the broth milky, and I do believe that there are so many different variables with gas range vs electric range and what is a low simmer vs hard simmer, so what one cook recommends might not turn out that way for someone who is following a recipe. The slow cooker not only eliminates those variables, but it makes is so much simpler to make broths in particular because 20+ hours is a long time to have something on a stove, and I much prefer the set-it-and-forget-it convenience of the slow cooker. I also love that the whole house doesn’t get that gross humid broth smell for 2 days. Thank you for posting this! Oh, I forgot to mention that it turned out PERFECTLY after following the directions to the letter. This is so exciting! Thank you so much for your recipe. I wish I could I hug you thank you. Why? Because I made seolleongtang last year after going on a sugar free diet (due to Candida), I wanted a way to add more minerals to my diet. In India, they have something called paya, made from goat legs. But I wanted to try something different. I made the seolleongtang for one entire day and some of it turned brown. I think it had to do with the length of time I soaked my meat/bones in water before the “cleansing boil”, to remove the impurities. Anyway, as you can see I can’t shut up because I’m so excited by the fact that your method uses a slow cooker! This is awesome. I think your sagol-guk will be the perfect secret weapon to influence my Dad to incorporate more protein in his diet. He avoids meat like the plague. I’m off to the market today to pick up some beef bones. Thank you so much for your sweet comment and support. I mother, also, does not eat meat but will drink this soup with rice. I think it definitely does add nutrition to her diet. Let me know how it went in the slow cooker and if you have any questions. I also like oxtail soup (kkori-gomtang) for the family, which is similar in the taste and cooking process but I find actually easier and richer in taste. I have the recipe in this site but for some reason, it’s not letting me attach the link to this post. Anyways, best of luck and thank you again! It’s definitely easier and less time consuming than the classic bone broth. I followed your instructions and use the slow cooker. The entire cooking process took about 5 hours and the whole house smelled like kkori-gomtang. This is why I love Korean food. It’s hearty just like this soup. Thank you again for sharing the recipe. I’ll definitely make it again when the time is right. I will always remember you and your recipe. Thank you very much, Priyanka!!! You’re so kind… Yes, I am planning to start posting more recipes. Your support means a lot. Thanks again!! !